Tucked into a lively shopping and restaurant district, our resort is just steps away from sidewalk dining, outdoor music, and local events. 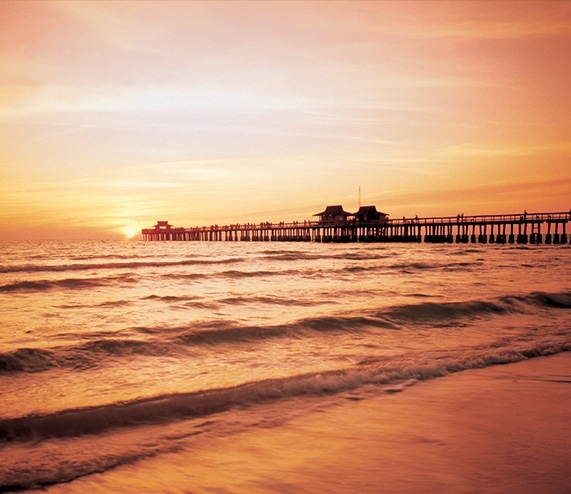 Experience the very best of Florida’s Paradise Coast with Bellasera. Sailing seasonally from Marco Island, the Key West Express ferries guarantee you a fun ride, with snack bars, cocktails, and sundecks. This small fishing community features an interesting history as well as great opportunities for boating and water activities. Explore the largest mangrove forest in the United States. Port of the Islands, our sister resort, is your hub for Everglades adventures. Featuring white sand beaches, crystal clear water, and vibrant seashells, Sanibel Island is also home to many restaurants and shops. This eclectic downtown area features great shopping and dining, as well as weekly events such as farmers markets, live music, and more. Offering live entertainment, nightly themes, and daily drink specials, Blue Martini is the place to go for tasty martinis and tapas. Take a quick walk to this upscale seafood and steak house, offering fresh fare, delicious wines, nightly entertainment, and posh surroundings. Serving up innovative takes on authentic Gulf Coast seafood, the waterfront Riverwalk restaurant is a Naples favorite. Intimate, clubby, and traditional, St. Germain Steakhouse wants to take you back in time to the good old days of dining establishments. Cozy up at Bleu Provence, a French bistro featuring a menu of award-winning cuisine and an extensive wine list to accompany it. This award-winning public tennis facility at Cambier Park features twelve lighted tennis courts for guests to enjoy. Rent high-quality paddleboard and kayak equipment, borrow some beach gear, shop for souvenirs, or even a grab a snack at Cabana Dan’s. With over one million gallons of water, four pools, five waterslides, and a lazy river, Sun-N-Fun Lagoon is Collier County’s premier water park. A hands-on experience where kids and families can interact and learn, C’MON offers a wide variety of fun exhibits and activities. Canoe, fish, boat, or just check out the Florida wildlife at this beautiful, isolated beach—home to manatees, dolphins, marsh rabbits, and more. Strategically designed to be both fun and challenging, this unique track is one of the most remarkable in all of Southwest Florida. PGA Tour professional Greg Norman designed this serene championship course, featuring 36 holes and a panoramic view of flourishing foliage. With five sets of tees, this Gordon Lewis design is versatile enough for golfers at any skill level to enjoy. Named as one of Golf Digest’s Best New Courses for 2014, this pristine championship golf course is peaceful, yet challenging. Gordon Lewis designed the enormous 18-hole championship course at Bonita National, offering scenic foliage and plenty of obstacles. Only steps away from our resort, Fifth Avenue is a street lined with one-of-a-kind shops, galleries, theaters, and arts centers. Waterside Shops features the most luxe brands and high-end restaurants in a beautiful architectural setting with water features throughout. This fun shopping and dining complex is a throwback to Naples commercial fishing days, as it was once a tin-roofed dock facility. Beautifully set right on the waterfront, this fashionable shopping district features nearly 60 unique shops, galleries, and restaurants. Bargain shoppers will love this outlet mall, offering 30 factory outlet stores including popular brands and a handful of local specialty stores.